Above, the North American Arms set of high-energy mini-revolvers we compared, with Speer Gold Dot Ammo. Lightning Bolts not normally included. We braved the February Illinois winds to do a brief comparison of three North American mini-revolvers, all in .22 Winchester Magnum Rimfire configuration. Alright, well there wasn't that much bravery involved, but we did dress appropriately. 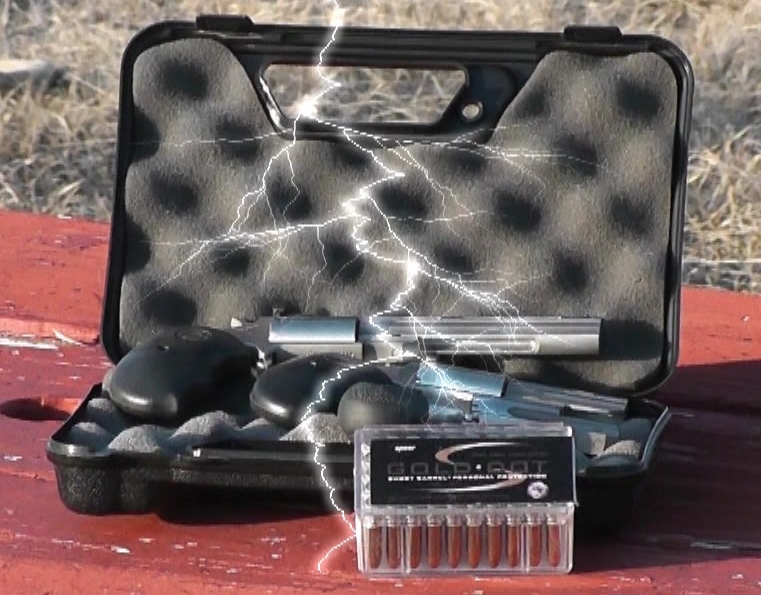 The goal was a brief accuracy comparison using Speer Gold Dot Short Barrel personal protection ammunition, developed for a 1.9 inch barrel in .22 WinMag. We cracked off five round groups at 10-1/2 yards, certainly farther than the common breaking down your door or attempted carjacking self-defense ranges, but we wanted some basic barometer of realistic accuracy across the NAA line. The three factory condition North American Arms mini revolvers used were the one inch barreled NAA Pug, the two inch NAA Black Widow, and the four inch barreled NAA Mini-Master. All are slim, thin, easily concealable and transportable handguns. All use the same basic action, all have the NAA safety notch on their cylinders, so all three examples offer you five quick shots at a moment's notice. The NAA PUG-T has fixed sights, the front bead is Tritium, while the Mini-Master and the Black Widow both were the adjustable sight models. It was windy and despite deploying our electronic countermeasures (wind-reducing stereo mics) there was still substantial wind-noise on the video we constructed for your entertainment pleasure. While not as bad as someone driving a tractor through your house, it was the best we could do considering the ambient conditions. We plan to do a few more tests, including different ammunition and another NAA model, under calmer conditions. The NAA minis are always a lot of fun to shoot, regardless. North American Arms product has been in high demand of late, with the NAA backlog running at up to 20 weeks or so. It seems a lot of folks are catching on as to how convenient and reliable the NAA minis are and they have spawned a goodly amount of collector interest as well. Of the three, predictably the NAA Pug was the least accurate, with a one inch barrel and a very short sighting plane, it isn't designed for longer ranges. Perfectly adequate for intimate use, it does not easily group tightly out at ten yards plus. Also, at least somewhat predictably, the NAA Mini-Master was easy to shoot and easy to shoot well. It has bested far more expensive .22 handguns in times past, with the .22 LR cylinder installed. The big surprise of the test was the Black Widow. 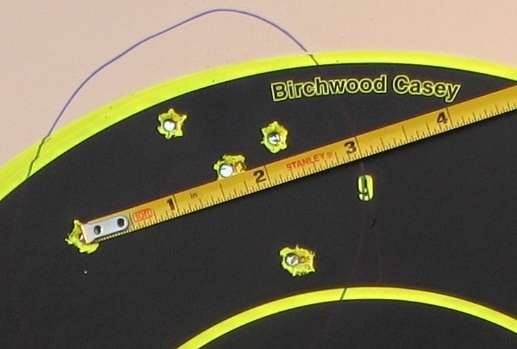 We just casually cracked off shots, not using any particular rest, yet the Black Widow produced five shot groups inside 2-1/2 inches, 2-1/4 inches center-to-center at 10.5 yards. 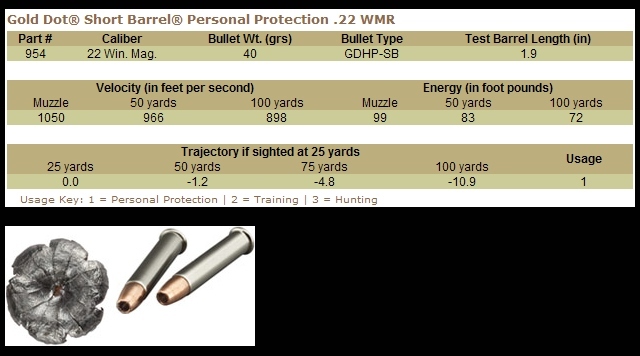 This is an impressive level of accuracy with the Gold Dot .22 WMR personal protection ammo, better than needed for close self-defense applications and remarkably good for a little two-inch barreled revolver that fits most anywhere. North American Arms offers a wide variety of mini-revolver models to try to please everyone, but in our opinion the Black Widow is very hard to beat in the size / performance ratio category.